1] I am a bow in your hands , Lord. Draw me, lest I rot. 2] Do not overdraw me, Lord. I shall break. 3] Overdraw me, Lord, and who cares if I break! That quotation is from the prologue to Cretan author Nikos Kazantzakis' autobiographical novel Report to Greco. Bohuslav Martinů's opera The Greek Passion is based on another novel by Kazantzakis. Greek electronic composer Vangelis' 1998 album El Greco has the famous painting The Knight with His Hand on His Breast by the Greek artist on its cover. 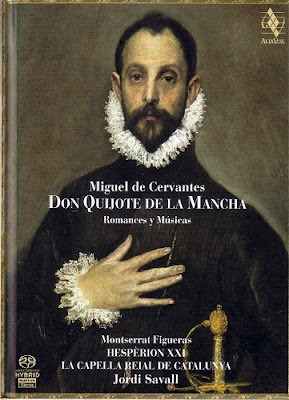 As does Jordi Savall's Don Quijote de la Mancha, seen below. My copy of the double CD and book was signed by Jordi Savall on the day of our just in time interview. Jordi Savall is living testimony to the 'Overdraw me, Lord, and who cares if I break!' approach to life. But, as the audio file of my interview tells, he also places great value on inner peace. I was reminded of that recently when I came across these words by Black Elk, a nineteenth-century Holy Man of the Oglala Sioux. The first peace, which is the most important, is that which comes within the soul of men when they realise their relationship, their oneness, with the universe and all its powers, and when they realise that at the centre of the universe dwells Wakan-Tanka, and that this centre is really everywhere, it is within each of us. This is the real peace, and the others are but reflections of this. The second peace is that which is made between two individuals, and the third is that which is made between two nations. But above all you should understand that there can never be peace between nations until there is first known that true peace, which, as I have often said, is within the souls of men. Below is a CD dedicated to the victims of a terrible event that underlined the desperate need both for inner peace and peace between nations, the destruction in June 1942 of the village of Lidice near Prague by German troops. Profits from the sale of Concert for Lidice go towards the continuing humanitarian work at the village. Martinů's music features on the disc, as do two works by Antal Dorati, a great musician whose final written testament was a plea for For Inner and Outer Peace. 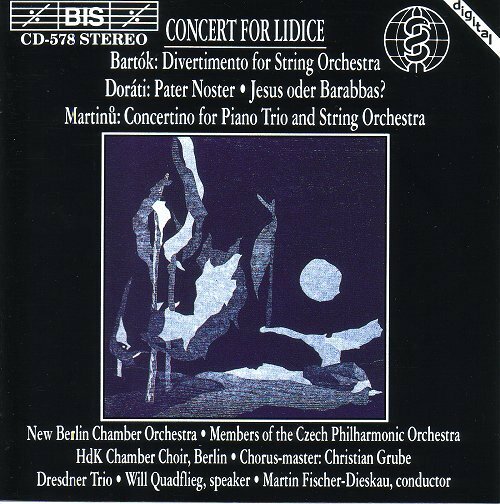 The two works on Concert for Lidice are his Pater Noster (1988) and melodrama Jesus or Barabbas? 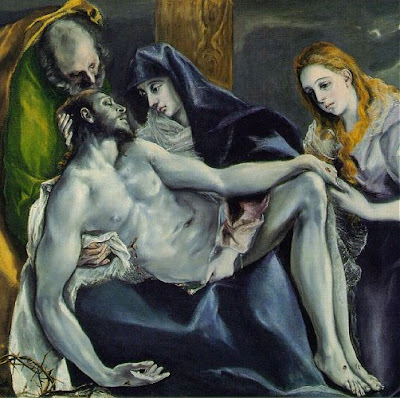 (1987) Which, as my header image is a El Greco's Pietà, brings this post full circle. Concert for Lidice was created as a concert and as a BIS CD by the inspirational folk at International Physicians for the Prevention of Nuclear War (IPPNW). Read more about their work in Mahler's message for German parliament.